I am a writer. I also teach. A little bit twangy country, a little bit Coen Brothers, Rolling Nowhere journeys down those mythical train tracks. By Alice Wynn. Originally published in Metro Spirit – Augusta, Georgia. AUGUSTA, GA — It’s no surprise that Atlanta band Rolling Nowhere was inspired by a touch of wanderlust. Formed in early 2009, their name was taken from the Ted Conover book of the same name. In the ’70s, Conover, an Ivy League student fascinated by hobos, dropped out of school and immersed himself in their way of life. Rolling Nowhere brings that same spirit to their music as well. “All of our songs are either about being lost or wandering, hitting the railroad tracks, just a lot of vagabond, beatnik-type stuff,” said vocalist and guitarist Brad Cochran. Cochran, a Rome, Ga., native inspired by the Beat writers, ended up on the open road as well. He moved from Wyoming to Atlanta and, after he went through a divorce, he bought a guitar. He wrote music with a roommate, but when his roommate moved back to Boulder, he found himself stuck with a bunch of songs. One day Mark Petty, who had previously played in heavy metal bands, called him and told him that he bought an upright bass, so the two started playing together. “We ended up doing a couple of open mic nights and people just encouraged us from there,” he said. When they were offered a gig, the two were unsure if they could pull it off, so they recruited dobro player Reed Van Hooser. They recorded “The Lonesome EP” last year and things started getting underway for the band. 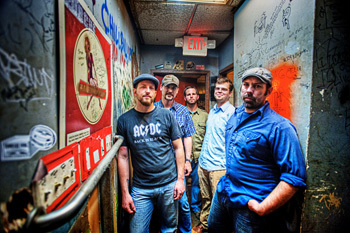 Six months ago, they added mandolin player Cory Chambers who also shares songwriting duties. Matt Green came along as well, playing banjo, mandolin and drums. And even though Rolling Nowhere is Cochran’s first band, never even having been on stage before, he decided from their first show to be 100 percent himself when performing live. The band is looking to have an album completed by the end of September, perhaps get some of their songs on some indie film soundtracks and maybe hit the festival circuit next summer.